It was decided that a casual ride around town was in order for the proper launch Bike Friendly Richardson. Although the official launch of BFR isn’t until December 1, we thought we should capitalize on the closest holiday. Since Thanksgiving is a time for family, we settled for the next best thing, Black Friday. We could have a fun ride, launch BFR and avoid the crowds at the mall. This particular Black Friday was an amazing day for a ride. The weather started off cool, but ended up being perfect. 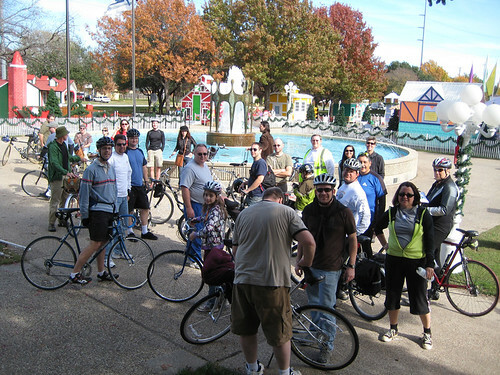 As planned, about 25-30 riders showed up at the fountain at Santa’s Village in front of the Richardson Civic Center. 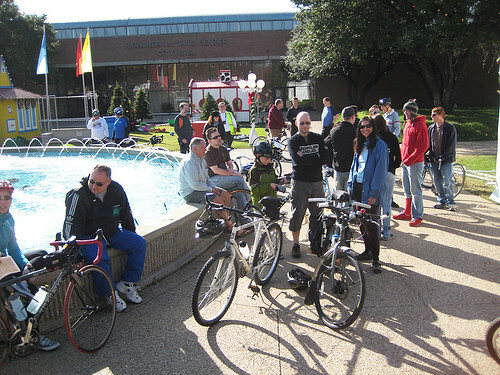 It was an eclectic group of riders ranging from Richardson locals, a few folks from Bike Friendly Oak Cliff, a few more from Dallas and other parts of the Metroplex and one surprise rider from the Richardson City Hall. Dave Carter, Asst. 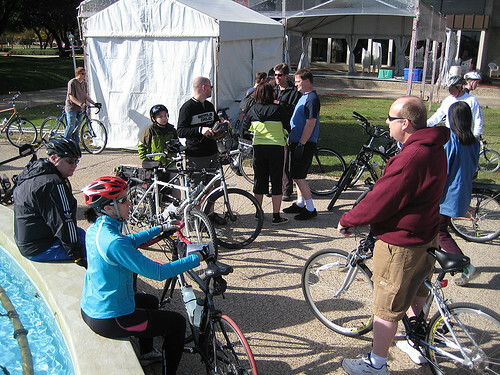 Director of Development Services, Transportation and Traffic, took this opportunity to meet casual riders and get their perspective of riding around town. Once everybody showed up, we started rolling at a pretty steady pace. The route that we ended up going was actually the reverse of the original plan. It was brought to my attention that the new direction was actually easier for any newer riders. The only problem with the reverse loop is that it brought us to the rest stop a bit earlier in the ride. I figured since this was a casual ride anyway, that an early break would be fine. 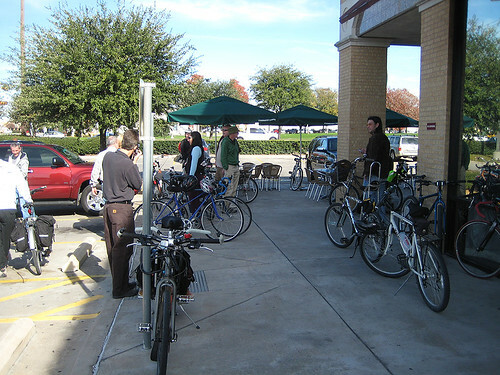 A little less that 4 miles into the ride, we ended up at the Starbucks at Coit and Campbell. The group hung out for a bit, fueled up on caffeine while they enjoyed the day. Some additional folks joined the group, while a few others had to break off because of other plans. When we were finished with our drinks, we started the remainder of the ride. 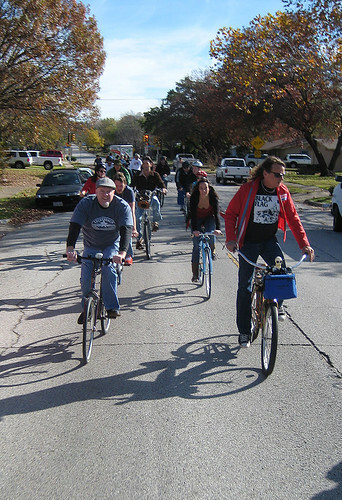 The group rolled towards south Richardson, then eventually back east towards out starting point. The pace remained steady as members of the group kept me appraised to the state of the folks who were bringing up the rear. The great thing about the group it that everybody pitched in to keep the group together and safe. Traffic was light, and with the exception of a little climb towards the end, the route was pretty level. In the end I wanted the group to see how easy it is to get across Richardson – especially when you take the back roads. When we got to back to Santa’s Village, folks hung out for pics and to visit just a bit longer. The general opinion was that it was a good 9.2 mile ride. For me, it was a great ride – not the route, but rather the company. 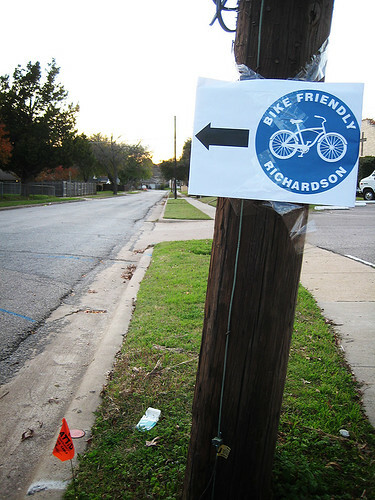 I thank all the great riders who made it out to the inaugural ride of Bike Friendly Richardson. Below are some pics from the ride. I’m so happy for you and the group 🙂 I knew it would be great! I’m not missing it next time. Thanks for the writeup. Looked like a blast. I’ll be at the next one, enshallah. WOW! It looked like fun. I am disappointed I missed it. When is the next one?